Frozen Pipes, Seattle ? How to prevent them! Ready for a rough Pacific Northwest winter? Winters here can be unpredictable, even without El Nino and La Nina effects. 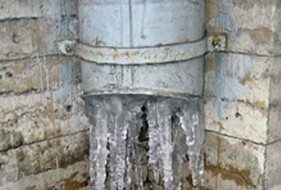 Don’t get caught off-guard this season, and have to endure the expensive problems that frozen pipes can cause. •	Wrap pipes and valves in unheated areas with heat tape or cover with pipe-insulating material. Find these materials at your local hardware store, and follow the manufacturer's instructions. If you don't have the time or ability for this job, which can sometimes mean accessing difficult-to-reach areas under your house, then its better to call a plumber first rather than to call them during a cold snap to come thaw and replace pipes and then insulate your plumbing. •	When you know a cold spell is coming, turn off your irrigation system and drain water from the lines. Water left in the system can freeze and break pipes. Disconnect garden hoses from your house and cover taps with insulated covers that can bought inexpensively at home improvement stores. •	Know where your main water valve is. When you have a problem, turning the main valve off may stop water from flooding your home. You can usually find this valve near your water meter, near the street in front of the home, or in your basement or the room where utilities are located.